Visitors to Japan are often excited about the variety of foods, but many people are a little nervous about eating customs in restaurants and Japanese households. It's helpful to know basic table manners before going to Japan. The most important table etiquette rule in Japan is saying traditional phrases before and after a meal. Japanese people traditionally say, "Itadakimasu" before a meal and "Gochisousama" after a meal. Itadakimasu means thanks for the food in Japanese. Gochisousama is said to indicate the ending of a meal and to express gratitude to those who cooked and served the food. If you're eating with Japanese people, be sure to show respect for their customs by saying these phrases. The Japanese eat at low tables while sitting on floor cushions. Before sitting, it is customary to remove your shoes. Be careful not to step on others' cushions. Japanese people do use knives, forks, and spoons to eat certain dishes, but chopsticks are still the most frequently used utensils. Try to hold the top chopstick between the thumb and the middle and index fingers as if you're holding a pen. Hold the bottom chopstick between the thumb and the ring finger. To pick up food, move only the top chopstick. Chopstick etiquette requires that you do not directly pass food from your chopsticks to somebody else's chopsticks and vice versa. It's also important not to stick chopsticks vertically into food, especially into a bowl of rice. It's also not polite to wave chopsticks above food dishes or to use them to point at somebody. When eating rice or soup from small bowls, it is polite to lift the bowl to your mouth, which prevents you from dropping food. When you do not get a soup spoon, it is proper to sip the soup out of the bowl and eat the solid food with chopsticks. Use chopsticks to bring the noodles to your mouth. For noodle soups, you will also use a ceramic spoon or drink directly from the bowl to eat the broth. It is common in Japan to make slurping noises while eating noodles, such as ramen and soba. People say the food tastes better if they make slurping noises. Audible chewing of other foods, however, is considered rude. Sushi and sashimi can be eaten with your hands or chopsticks. A piece should be eaten all in one bite. For bigger types of foods, it's acceptable to use chopsticks to break the foods into smaller bite-size pieces. Condiments include soy sauce, wasabi, and ginger. Be sure not to pour more soy sauce than you'll use because it's perceived as wasteful. For sushi that goes well with wasabi, the chef will have already added it. If you prefer more wasabi, only use a small amount so as not to offend the sushi chef. Wasabi or ground ginger is added to sashimi pieces before they're dipped into soy sauce. It is polite to serve others their drinks, but you shouldn't pour your own. Once everyone has a drink, the Japanese raise their glasses and say "kampai," the equivalent to "cheers." As in most cultures, it is advised not to appear drunk at formal restaurants. 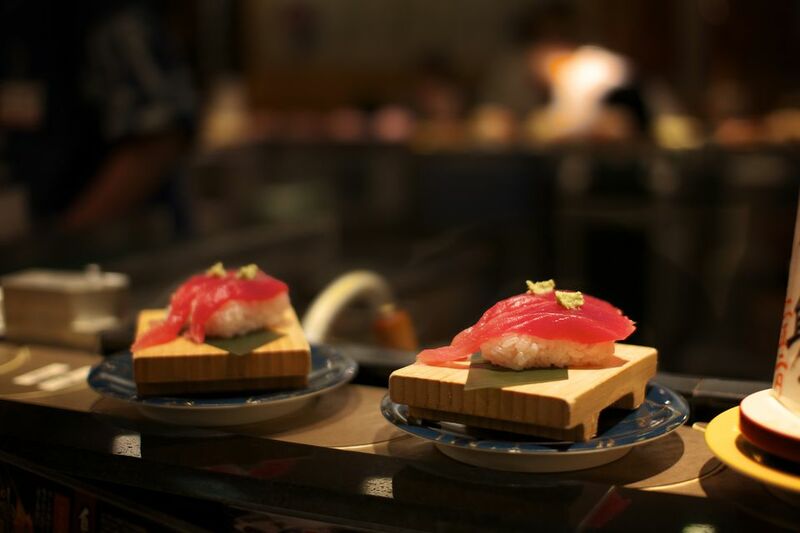 At less formal restaurants such as izakaya, however, it can be acceptable as long as you're not bothering other patrons.